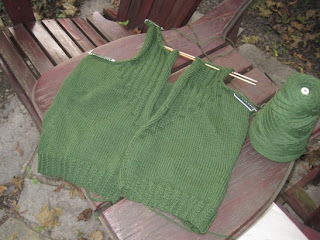 and last night I finished that and shifted over to the top of the back, making it once again a Portable Knit. I'm getting panicked about the baby sweater I was supposed to have ready by the end of Labour Day weekend. Please note the lack of photograph, which illustrates the fact that panic has not yet led to picking up of needles. I did a test drive this morning for a run I'm going to have to make several times a week as part of my New Role this fall. The new role has many aspects, some of which will probably reduce my overall knitting output, but the dominant feature is the fact that I'm going to have to drive around downtown several times a week. And that is the biggie because I really, really don't like driving anywhere at any time. I've spent the last three weeks reminding myself that I passed my driving test, complete with highway exercises, just a year ago on my first try; sadly it's not much comfort because I've been so successful at avoiding driving ever since and am now completely out of practice. Even today I didn't do the test run myself but rode along with another driver so I'd know just how much traffic there is on the roads at the time I was planning to be out there. Answer: a lot. Expect me to be out driving, also a lot, over the next few days while I try to get more comfortable with this whole business. I came home from the test drive to find an e-mail from Biscotte, which tells me it's September 1 and I can open my first parcel for the current yarn club. YUM. And it's Felix sock yarn, which I love knitting with ever so much. I am totally knitting these. But not till I get some current socks off the needles, or until after the Kitchener Knitters' Fair - whichever comes first - because I am still out of 2.25mm double points. I was going to order more KnitPicks ones but it was going to cost a small fortune in shipping for some reason, so I'm going to wait till they're on sale, or until I need something else from there to justify it all. In the meantime, I'm thinking about Addi dpns, which will probably be plentiful at the Fair. Worth a try, right?